If you want a breathable open back top for the gym or any other summer fun activity you can't go wrong with this classic from Nike. It's a small investment in your comfort while you school the boys at your gym what #beastmode is all about. This top just makes me happy, the beautiful coral orangey color, the buttons and the ruffle bottom all remind of a lazy sunday at the farmers market or a day on a beach boardwalk. Rock your bronzed shoulders, and wear that mood necklace you've have since 6th grade for a good vibes look. Jeans make it casual, a long boho skirt makes it date night material. Pair it with shorts or leggings for a more athliesure look. 6.) Que Chula! Yes mamacita! Chula is the spainish word for pretty or cute. 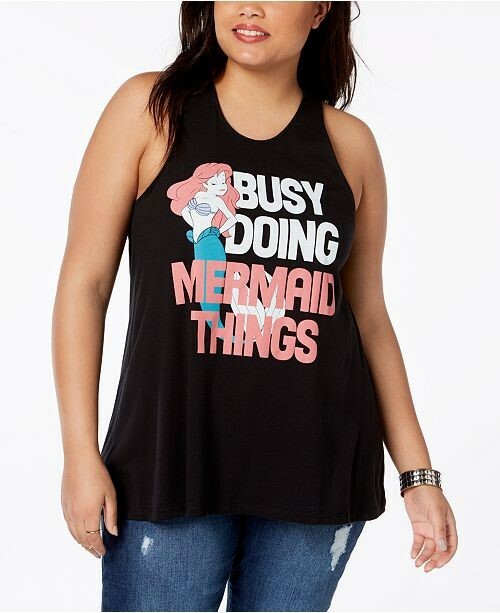 You can rock this tank everywhere from the mall to the beach to the movies while being a cool as heck chica. I'm in love with the model's oversized hoops, hello goodbye! 7.) Do you want a queen of the office/boardroom/life vibe? Then rock this wrap top from Forever 21 with sparkling dangles like the ones here and a high slicked back low pony tail or if you're rocking a shorter cut (like you're truly) then a sleek look is the way to go, no mussing here. 9.) Ok, I'm not saying you shouldn't love ruffles but they can be a bit much sometimes. 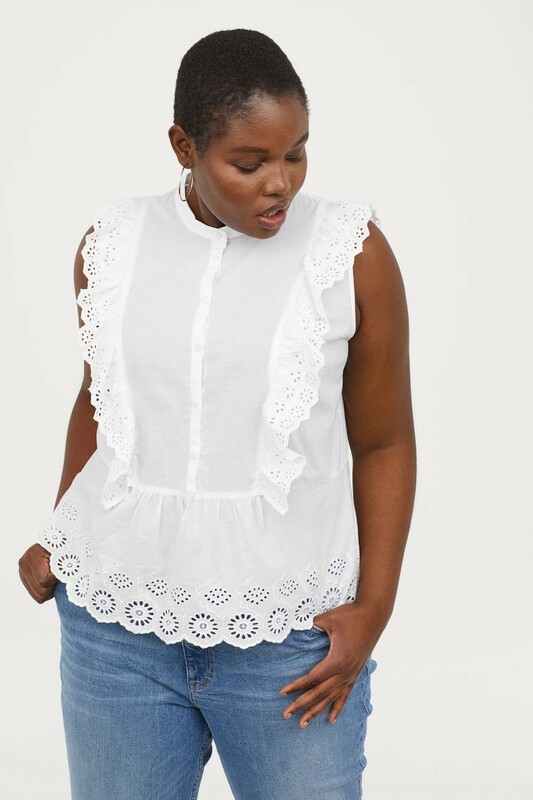 H&M got it perfect with this top though, the details are delicate and the eyelets give it a wholesome look. This is perfect for the office if you wear a camisole underneath or just a bra on those hottest of days when you're just trying to live your life and the heat is oppressive. I also would wear this to a picnic or afternoon event, because the details are so good, I don't think you'd need jewelry, but that's me; you live your best life. 10.) Boss Babe alert- Ok confession I love this whole ensemble from Torrid.com But let's talk about the amazing green color here. Kelly green is one of my favorite colors because it looks good on every skin tone, it's a jewel color and photographs soo well. The cut is super flattering on so many different body types and the thin, floaty material sits well, by this I mean it doesn't just hang like a tent. The open collar means you'll have a clean midline and can pair this with pretty much any bottoms you like. Ok Lovlies, that's all for now! I hope you liked this bonus CGINTW post, we're trying to save you money while you look fabulous! If you use the code below to sign up for Ebates.com you'll save money everytime you shop at partcipating stores when using the Ebates app or when you download the Chrome extension it will auto alert you when you navigate to a partcipating store so you never miss a chance to earn cash back. Every quarter you'll get a check or a paypal payment. Remember the savings is only worth it if you were ALREADY going to purchase an item, it's not savings if you buy more than you were going to, that's called lifestyle inflation, don't do that. Lifestyle inflation is bad mmm'k? This was a bonus post for your Sunday Funday but we'll be posting every Wed. and Sunday starting on August 1st. Wednesday is news, lifestyle and fitness day. I call this our "grown up" stuff. Sundays are all about Fashion and fun. I love it cousin. Such style and flair. Yasss!! Honey you have picked out some swag for us to drool over😍😘🙌 I love the sporty tops.